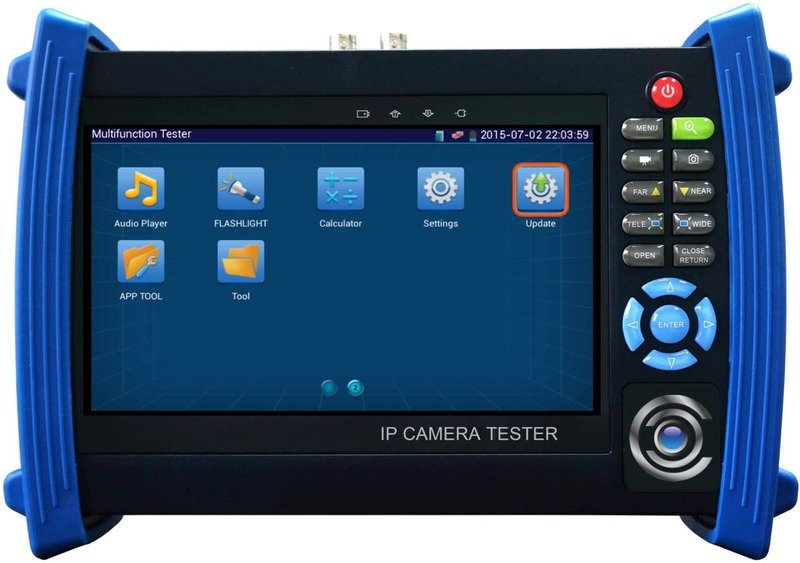 The MON-IP7 is an IP camera test monitor and CCTV camera test monitor with a 7" LCD touchscreen. 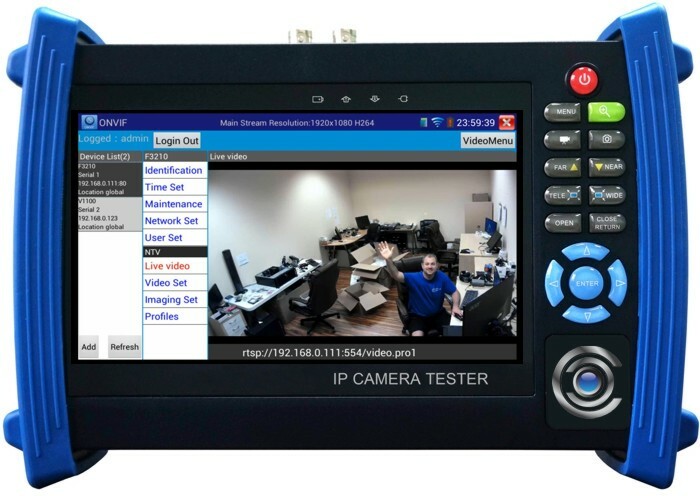 This test monitor is capable of displaying video from both IP and Analog / CCTV video streams. The MON-IP7 supports more than 40 customized IP camera protocols including Samsung, HikVision, Dahua. 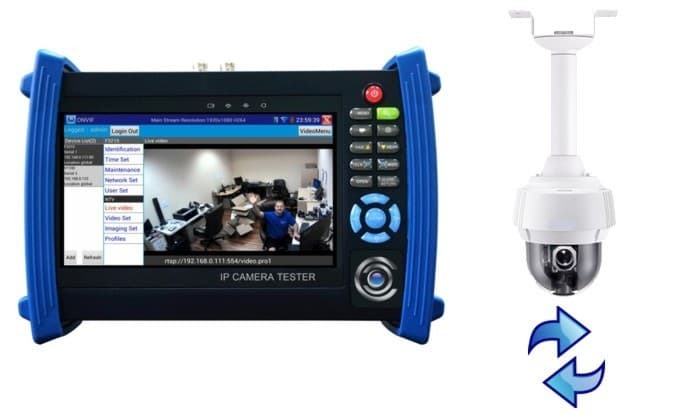 The tester also supports ONVIF which allow it to connect to any ONVIF compliant IP camera (4K Max Resolution). A 7-inch TFT-LCD screen features a resolution of 1920 x 1200. The touchscreen support makes it easy to navigate the menu system of the tester. You can watch a video demo here. Please note that this monitor is also available under product code MON-7HD which also supports HD security cameras (HD-TVI, HD-CVI, and AHD). Users can connect to their IP cameras by using the built-in LAN port or by using the built-in WiFi for a wireless connection. When using the LAN port, the monitor can power the IP camera via PoE (24 watts maximum power over Ethernet). The MON-IP7 can also power CCTV cameras by using the DC-12V / 2 Amp power output. With the Micro SD Card Slot, users can record and playback video directly on the monitor. The HDMI video output supports 1920 x 1080 resolution. Both Analog and IP PTZ protocols are supported for PTZ camera testing. With a fully charged battery (6 Hour Charge Time) the monitor can last up to 10 hours with normal use. The full-featured user-friendly OSD (On Screen Display) allows the user to navigate through all menus and adjust settings with ease. A few more features of the MON-IP7 include audio in / out, IP address scanner, port finder and link tester. All of this comes neatly packaged in a padded carrying case for easy storage and portability. Download MON-IP7 product specification PDF. 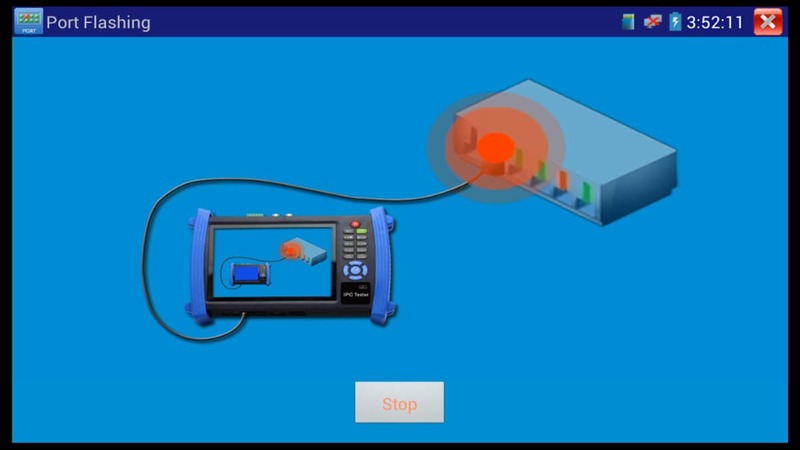 Watch this video to see how the test monitor connects to a network via WIFI, then scans the network for ONVIF compliant IP cameras. Last, the installer displays the live video from a Zavio F3210 IP camera on the screen. One of the main functions of the MON-IP7 is the ability to display a live video feed from any ONVIF compliant IP camera. The below image shows the tester connected to a Zavio F3210 IP camera. 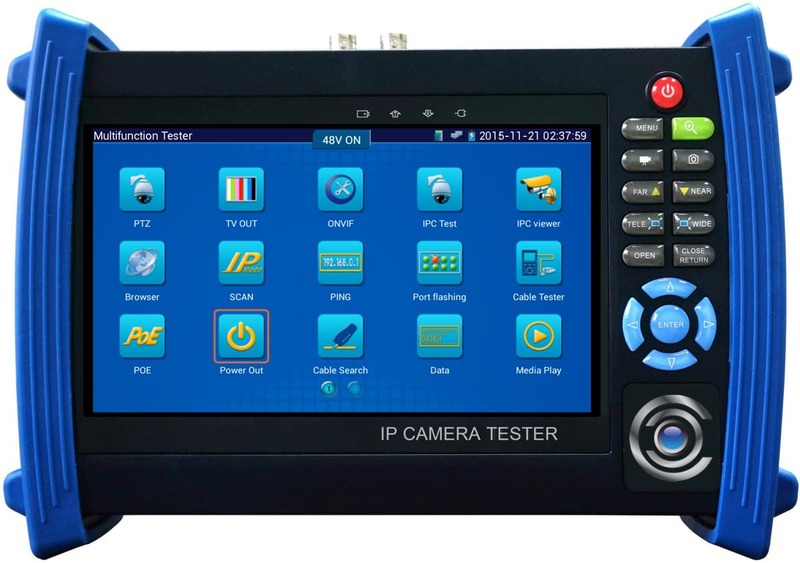 You can view instructions here on how to setup the monitor for IP camera testing. The IP camera testing function of the MON-IP7 is compatible with ONVIF compliant IP cameras. We can say with almost 100% certainty that the video tester will work with all IP cameras that are compliant with ONVIF standards. We say almost 100% certainty because there are several versions of the ONVIF specification and it is up to each IP camera manufacturer to write their firmware to the specification. Some manufacturers are better at software development than others. Also, please keep in mind that some manufacturers may only have some of their cameras compliant with the standard. Below is a list of some of the big IP camera manufacturers that participate in ONVIF. The port locator app lets installers trace which port on a network switch an Ethernet cable is connected to. This tester works with non-PoE and PoE switches. The installer connects the network cable (CAT-5, CAT-6, CAT-5e, etc.) to the LAN port of the MON-IP7 test monitor and the testing tool sends a signal to the switch that causes the status LED to blink on the port that the other end of the cable is connected to. You can view instructions here on how to setup the network cable to switch tracing tool. Another great tool built into the MON-IP7 is the network cable tracer. The cable tracer uses a tone probe tool, that is included with the monitor, to locate network cables by using an audible ring when the signal from the monitor is detected. You can see the instructions for the network cable tracer tool here. The firmware of the MON-IP7 can be updated to fix any bugs and to add the latest features released by the developers. You can see the instructions to update the firmware here. The MON-IP7 can be used to power a POE compliant IP camera using the LAN / POE port. This is especially useful for installers who wish to test and / or adjust the camera angle of view prior to mounting the camera. 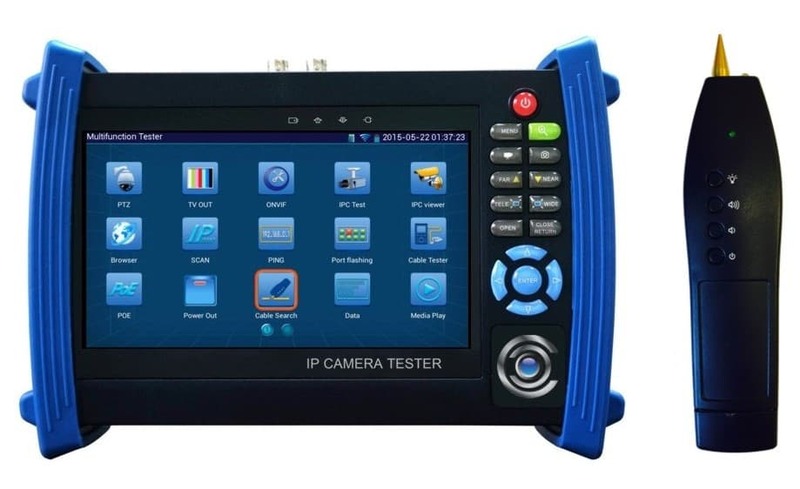 Please follow the MON-IP7 IP Camera Test Monitor POE instructions here to use the POE function of the MON-IP7. 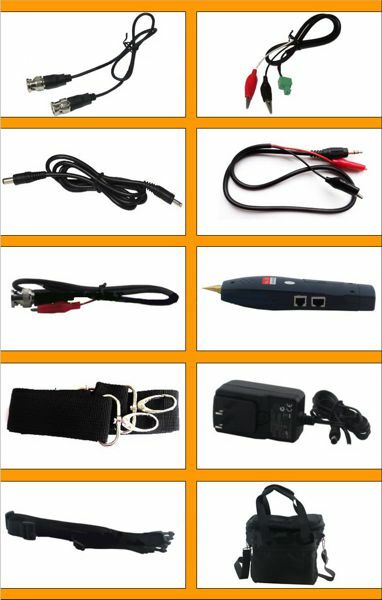 The below image shows the accessories that are included in the box with the MON-IP7: BNC jumper cable, 12V DC power cable, test monitor strap, storage bag strap, RS-485 cable with alligator clips, audio cable with alligator clips, remote UTP cable tester, power supply / charger, carrying case. I have been installing video surveillance systems for over 15 years. This tester helps me no matter what type of system I am installing. I use it for IP, analog CCTV, HD-TVI, and AHD cameras. I love having a single test monitor that works with all camera platforms.